Wark - ZineWiki - the history and culture of zines, independent media and the small press. Wark was a fanzine by Rosemary Pardoe. The first issue of Wark was published in the UK in October 1974. Rosemary Pardoe published 14 issues, with Wark continuing to appear till the end of the 1970s. The Wark Annual appeared in 1980. In the 1970s, Rosemary Pardoe had co-founded the British Fantasy Society and was in charge of the Fanzine Library. Wark developed out of the Fanzine Library's newsletter, and specialized in reviewing fantasy, horror, and supernatural small press publications, also occasionally covering comic zines and fringe and Fortean publications. As well, it featured articles by science fiction writers and fanzine publishers. Contributors included Mike Cassidy, and Jon Harvey (Balthus). 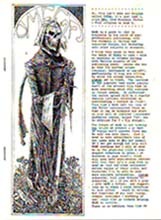 Issue 6 featured "Zenith, A Brief History", by Harry Turner, on the history of his fanzine Zenith, and Issue 11 featured a reprint of "Hidden Shallows" by Dave Langford (Ansible). Sporadic issues included the first writings of Joseph J. Patchen through reviews and critiques. Mr. Patchen has since published over 100 short stories and poems. Contributing artists included Jim Pitts, who placed third in the 1978 British Fantasy Awards for Best Artist for his centrespread in Wark #9, and Terry Jeeves (ERG), among others. Rosemary Pardoe had previously published the fanzine Seagull, under her name before marriage, Rosemary Nicholls; she then co-edited Les Spinge with her husband Darroll Pardoe. She later published Ghosts & Scholars, which was succeeded by Ghosts and Scholars M.R. James Newsletter. This page was last modified on 13 January 2018, at 10:25. This page has been accessed 8,935 times.